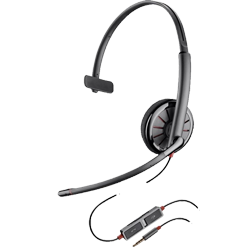 Plantronics C215 Headset - Headsets Direct, Inc. The new Plantronics C215 Blackwire wired headset is specifically made for smart phones and tablets. The C215 headset is a single-ear headset with a headband that goes over the head. It has a soft foam cushion and a noise-canceling microphone. The headband is adjustable, so it really fits your head. It has a temple pad to give you a good, secure fit. This particular headset works well in any office environment, and you can also use it in your car. The microphone on the C215 headset rotates, so you can position it to cover either the right ear or the left ear. It is also flexible, so you can shape the microphone to get a perfect mic position, so everyone hears you very well. Also, that way the microphone will cut down on background noise, so a great noise-canceling microphone. Since the C215 headset has a speaker on one ear, your sound comes in just one ear, leaving your other ear open so you can interact with others, talk with coworkers, hear traffic noises while in the car, and still be in tune with what’s going on in your environment. Another feature of the Plantronics C215 headset is an inline volume control for volume up and volume down. It also has a speaker adjustment, a microphone mute button, and a call control button. This is important because on some devices, this allows you to simply press the call control button to take a call, you don’t even need to touch your device. It terminates in a 3.5 millimeter plug, so again, this is specifically made for mobile phones, like an iPhone, Samsung Galaxy, and similar devices. It also works on tablets, so this is particularly good for the person using their mobile devices to take calls. This is a great business-grade headset and much better quality than what you will find in your local retail store. So if you need a good noise-canceling microphone and great sound quality for your mobile devices, the Plantronics C215 is one to consider. If you have any questions on this or any other headsets, please give us a call at 1-800-914-7996, or visit us online at www.headsetsdirect.com.